advice. And, after his passing in 1969, I published an article memorializing him in the weekly journal Panim el Panim. After I confirmed that I was one and the same, the Rebbe asked me if Rav Aryeh had left behind any writings. In fact, Rav Aryeh did leave a number of manuscripts, including an explanation of the entire Mishnah, parts of which were eventually published. At that time, however, his only published work was a booklet about the famous Kabbalist known as the Leshem, who had been Rav Aryeh’s mentor. I told this to the Rebbe, adding that Rav Aryeh was a “walking Torah,” and I quoted a number of teachings that I had heard from him. I followed that up with some stories about Rav Aryeh which seemed to fascinate the Rebbe. At a certain point the Rebbe’s secretary interrupted, saying that an hour had passed and I needed to finish up. “Forgive me,” I immediately apologized, “I know I was supposed to be here only for ten minutes.” But the Rebbe urged me to continue. So another hour passed as I told him more about Rav Aryeh. Altogether, the meeting lasted two-and-a-half hours and, at its conclusion, the Rebbe suggested that I write down all that I had told him. He said there is a lot to be learned from the lives of righteous people – such stories penetrate the hearts and seep into the soul, and sometimes influence the readers even more than words of Torah. At the time I hadn’t considered writing a book about Rav Aryeh, but the Rebbe’s words stayed with me, and I began collecting the recollections of others. That story and the many others I collected were eventually assembled into a book published in Hebrew as Ish Tzaddik Haya and in English as A Tzaddik in Our Time. This book was hugely successful and was reprinted more than thirty times, as well as translated into Russian and French. I continued writing and eventually published a sequel entitled Tzaddik Yesod Olam, as well as other books about righteous men, including several giants of the chasidic world. All this came from the impetus I first received from the Rebbe. In addition to the profound effect that the meeting with the Rebbe had on my life, I was also left with a very strong impression of him as a truly holy man. When, before leaving, I mentioned that a woman I knew needed his blessing, he immediately rose from his chair to get a pencil and paper and asked, “What is her name and her mother’s name?” Although the Rebbe was a world-class leader, the moment someone spoke to him of a person in need of a blessing, he dedicated his full attention to that individual. Throughout the years I often corresponded with the Rebbe, and I sent him copies of my books, which he complimented. 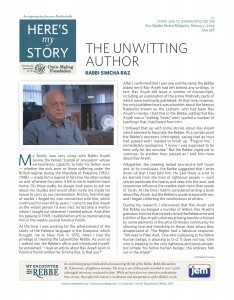 When he learned in 1978 that I was dispatched to Cape Town on behalf of the Zionist Federation of South Africa, where I was put in charge of the Jewish education system, he wrote to me that he hoped that in my new position I would still continue to write, since my writing was about authentic Judaism. As a part of my job, I supported everyone who worked to advance Jewish culture, including the Chabad emissary in Cape Town, Rabbi Mendel Popack. When my two-year contract ended, I was surprised to receive a letter from the Rebbe, saying that he hoped I wouldn’t mind him suggesting, without being asked, that I extend my mission in South Africa. He said he was allowing himself to give me this unsolicited advice because he felt that the public good demands it. Of course, I followed his counsel and stayed on for another two years. Of all the many people that I’ve met in my lifetime, the man who has most impressed me was the Rebbe. In my opinion, his character gives meaning to the words of the Book of Proverbs, “V’tzaddik yesod olam – a righteous man is the foundation of the world.” Just like a tall building rises to the heavens due to its deep foundation although that foundation isn’t seen and revealed to the eye, so too, the teachings of the tzaddik continue to inspire us – even if he has passed away and we cannot see him – as we learn from his ways. Rabbi Simcha Raz is the author of A Tzaddik in Our Time: The Life of Rabbi Aryeh Levin, as well as a number of books about Jewish leaders. He was interviewed in his home in Jerusalem in August of 2010.